SAN DIEGO, CALIF., UNITED STATES, September 7, 2018 /EINPresswire.com/ — Vetology® Innovations, LLC, an advanced veterinary technology and innovation company, will now offer automated heart evaluation tools to veterinarians as part of the company’s artificial intelligence (AI) radiology software. Vetology® introduced its AI radiology software last month. The software is designed to provide veterinary professionals with a first-of-its-kind automated diagnostic analysis of patient radiographs. Individuals subscribing to the Vetology® AI software suite will now gain full access to cardiac-specific tools, including automated heart size evaluation and automated Vertebral Heart Score calculations. These features work within the Vetology® AI dashboard automatically when a clinic uploads an X-Ray to the secure Vetology® cloud. There, the software automatically evaluates an animal’s heart size and the comparative size the heart in relation to the vertebral body size, creating a vertebral heart score. This process results in a Vetology AI heart evaluation report being back into the veterinarian’s hands as quickly as 2 minutes after the X-rays have fully uploaded. “The ability for a veterinarian to receive rapid heart analysis before they even begin evaluating a patient’s radiograph is invaluable. This technology leverages AI neural networks that are not yet available in human medicine. This new AI resource fulfills every attending doctor’s hope of having important diagnostic information available almost instantaneously.,” said Dr. Seth Wallack, DACVR, founder of Vetology® Innovations. 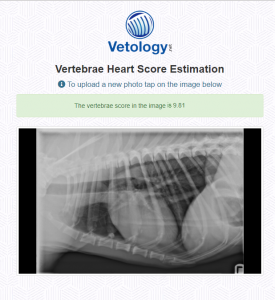 With chest x-rays being the most common screening test to look for heart disease, the heart evaluation technology of Vetology® AI can be a very powerful resource for veterinarians. Utilizing Vetology® AI’s heart evaluation tools within a veterinary hospital’s daily patient workflow is easy and requires limited setup. Veterinary hospitals receive a heart size evaluation and Vertebral Heart Score for each patient via their email and/or fax. Founded in 2011 and headquartered in San Diego, California, Vetology® provides innovative and emerging technology solutions for the veterinary community. The company serves over 2,000 veterinary hospitals worldwide and offers SAAS products that facilitate the highest quality of patient care and services. For more information about Vetology® AI and the company’s products, visit https://ai.vetology.net or for other company products visit https://vetology.net. Vetology® is a registered trademark of the Veterinary Imaging Center of San Diego, Inc.